Portland Growers Alliance at the Monday Pioneer Courthouse Square Portland Farmers Market. A few weeks ago Portlander Lauren Morse contacted me to see if I might put something up about Portland Growers Alliance, a marketing collective for the farmers of Mercy Corps Northwest's Agriculture Project in conjunction with Grow Portland. As a consumer, do you ever feel overwhelmed by the abundance of smells and sounds at Portland's bustling farmers markets? Imagine being a farmer there. Many shoppers do not realize the underlying steps required to orchestrate these markets. Farmers must reserve a stall, arrange transportation to the market, and communicate with customers. For many emerging farmers in the Pacific Northwest these simple steps are an impassable barrier. The Growers Alliance is a new marketing collective designed to help emerging farmers succeed. It was founded in 2010 as a partnership between Mercy Corps Northwest’s Agriculture Project and Grow Portland. Mercy Corps Northwest’s Agriculture Project provides refugees, immigrants, and new American growers with the access to land and supplies needed to begin market gardens. 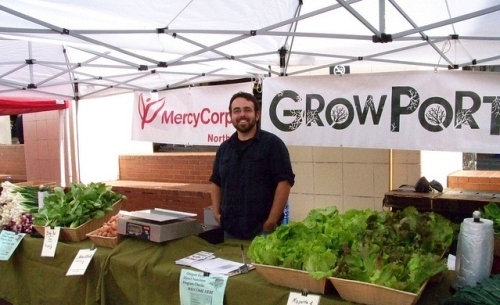 Grow Portland teams with Mercy Corps Northwest to provide the trucking and marketing services for growers to sell their produce locally. All growers are welcome to volunteer at markets and CSA pick-ups, but the Growers Alliance relies on its lead American growers to do the bulk of produce marketing. An increasing number of growers in the Pacific Northwest are immigrants, refugees, or beginning American farmers. Though they make up a necessary component of local agriculture, these growers often lack the English skills, business training, or access to trucking necessary to sell their produce to direct markets. (Direct markets refer to any sales that occur directly between the grower and the consumer.) Selling through direct markets, however, guarantees that growers will get the best price for their product. But what if you lack the English skills to communicate with consumers? Or what if your individual plot is too small to have your own CSA or farmers market stand? This is where the Portland Growers Alliance steps in. This year the Alliance is composed of Nepalese, Bhutanese, Slavic, Burmese, Somali, and American growers. Though their individual plots are less than an acre each, collectively they are able to sell produce through a Community Supported Agriculture (CSA) program, two Portland Farmers Markets (Saturday at PSU and Monday at Pioneer Square), and a few local restaurants. Visit the Growers Alliance webpage to learn how you can support these growers. Most important to their marketing efforts is recruiting members for fall CSA shares. Fall shares run for 14 weeks from late August through November. Members can pick up at Mercy Corps Northwest in Old Town/Chinatown or the Warehouse Café in Southeast's Brooklyn neighborhood. Sign up here! Contact Lauren for more information at lmorse at growportland dot org or 503.858.0216. Somali growers of Mercy Corps Northwest's Agriculture Program at Westmoreland Garden. 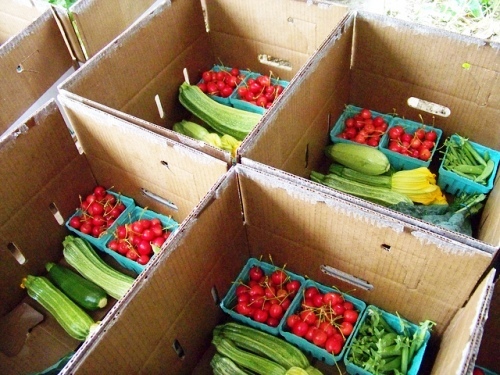 Portland Growers Alliance CSA boxes being filled in Southeast Portland.